This is a cross-post from the International Centre for the Study of Radicalisation, which hosted a seminar by former CIA officer Michael Hurley. The original post can be found here. Michael Hurley, a former CIA Officer, was closely involved in the hunt for Osama bin Laden throughout the 2000s. He served three tours in Afghanistan post-9/11, leading Agency staff and Special Forces in southeastern Afghanistan. He was one of the CIA’s lead coordinators on the ground for Operation Anaconda, the largest battle against al Qaeda during the campaign in Afghanistan. Subsequently, he served on the 9/11 Commission’s staff as a senior counsel and director of its counterterrorism policy investigation, drafting substantial portions of the policy chapters of the Commission’s final report. Before 9/11, Hurley was detailed to the National Security Council, where he was director for the Balkans. At the CIA, he was involved in the U.S. interventions in Kosovo, Bosnia, and Haiti, and also held a range of management positions at CIA headquarters. 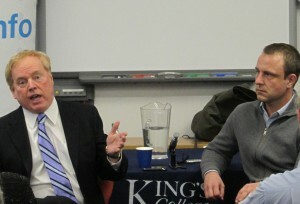 Mr. Hurley recently gave a seminar hosted by the ICSR discussing the intelligence community’s hunt for Osama bin Laden. Below are a few responses to some key questions. How did the CIA go about looking for bin Laden after the 9/11 attacks? The CIA had teams on the ground, as well as Special Forces (American, British, Australian, and others) backed with US air power. On the intelligence side, the CIA would work with local Pashtun people who could freely cross into Pakistan and come back to provide intelligence on where High Value Targets like Osama bin Laden, Ayman al-Zawahiri, Mullah Omar, and others might be located. The problem with going into a new country is that you don’t have vast networks of trusted, dependable agents to provide quality information, and there is always a question of reliability when money is the primary motivator. The Afghanistan-Pakistan region is not an area where you can send your own personnel for collection, and while there were technology-driven collection efforts, al-Qaeda members for example learned quickly not to use their cell phones, which could be intercepted by the US. To go into Afghanistan quickly, the US had to use a light force, but the border between Afghanistan and Pakistan is long, mountainous and porous. Without sufficient military personnel, the US had to rely on local militias, which brings up the question of reliability. It wouldn’t have been difficult for bin Laden, who operated in Afghanistan for years and knew the area well, to have local support and slip past the border. The US and Pakistan were at a nadir in their relationship even before the operation to kill bin Laden for a number of reasons, which included the government contractor who was arrested for shooting several Pakistani citizens and drone strikes where civilians were unfortunately killed. But behind the scenes, officials from both countries do meet and resolve issues, and the fact that Pakistan is a nuclear power influences the relationship. Mr. Hurley recommends reading Chapter 4 of the 9/11 Commission report and Steve Coll’s Ghost Wars to learn more about the difficulty of getting an intelligence asset close to Osama bin Laden. Does the success of the drone campaign indicate intelligence on the ground has improved? The issue has always been connecting real-time intelligence with a kinetic capability. There was a time when we had drones but they weren’t armed, so they would gather intelligence and then an airstrike would have to be called in, which took time. What has changed is that the intelligence a drone collects can be collated immediately with kinetic action, and decision-making on kill-strikes is now done at a lower level in the military and CIA. There are lists of people who have been approved for lethal action, so it is much easier to receive the go-ahead to pull the trigger when the opportunity arises.